Of all the ice cream places on the “official” “Eat Before It’s Too Late List” that we’ve eaten, as well as my list of “other” great ice creams, I think I’ve gotten the second most nudges to visit Collins Creamery up in Enfield. Of course, purely by happenstance, two of my food blogger friends both live in Enfield and are totally unrelated to each other. Enfield, like a bunch of these towns between the Connecticut River and I-84 north of Hartford is half overly developed and half farmland. Vernon, Tolland, East Windsor… They all sort of have the same vibe. Here, the slogan is “On the Quiet Side of Town” and that definitely holds true. Not that anywhere other than right off the highway is very loud, but Collins Creamery, which is part of Powder Hill Farm (same owners) certainly does have an “I’m in Iowa” feel to it. And that’s not a bad thing when we’re talking about cows and their milk that’s used to make ice cream. Now, I didn’t ask anyone if their ice cream is REALLY made on-premises, which is sort of a requirement to make it to this list. But it sure appeared – and tasted – like it did. Unfortunately I can’t remember exactly what I had, but I’ll give an educated guess of peanut butter cup. And as for Hoang, we’ll say… Toasted almond. Damian? Some sort of berry. All three of us polished off our treats – and as you can see, Hoang double-fisted at times, Damian took what mama allowed in between scoops of his own. 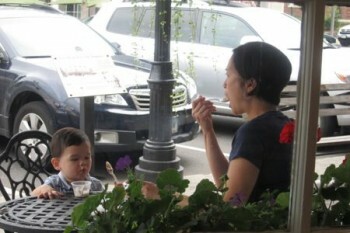 Note: Hoang was pregnant, Hoang loves ice cream, therefore, Hoang ate a lot of ice cream during September 2010. 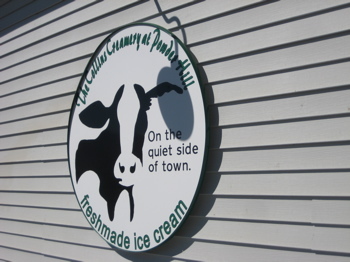 The Collins Creamery was founded in 1997 by Jack and Mavis Collins of Powder Hill Farm. 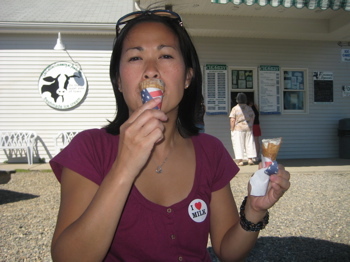 As bulk milk prices began to drop in the 1990’s, the opening of the Creamery was part of a greater effort to diversify their operation as well as to raise an awareness of the importance of local agriculture. 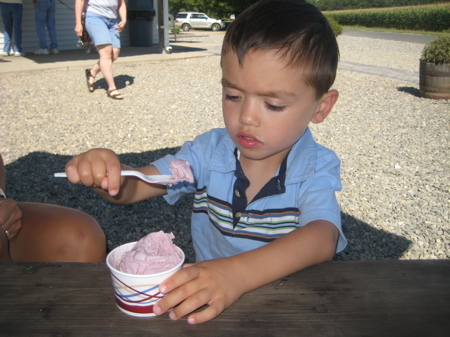 Now owned and managed by Tony and Michele (Collins) Bellafronte, The Collins Creamery continues to thrive by offering over 20 flavors of ice cream and a quiet, country setting with outdoor seating. 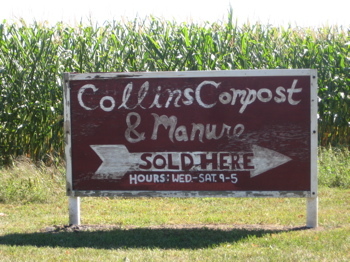 This is great – and not a unique arrangement – but the large sign advertising Manure and Compost on your way driving in to the ice cream area is a bit off-putting. Although, from the pictures of Hoang and Damian, you can be assured that there is no manure smell in the air. There was the smell of mums in the air though. As all small farms do, this place has branched out into other areas in order to make ends meet. 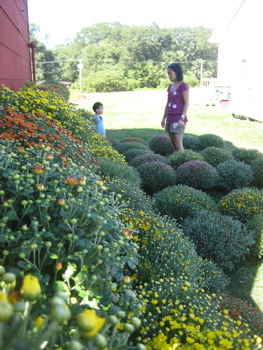 Here, they sell mums in September. Giant mums for half the price of mums half their size in the markets near my house. We picked up two pots of them and hit the road with fat and happy bellies. LOVE Collins! You can taste the total freshness of the milk in every bite. 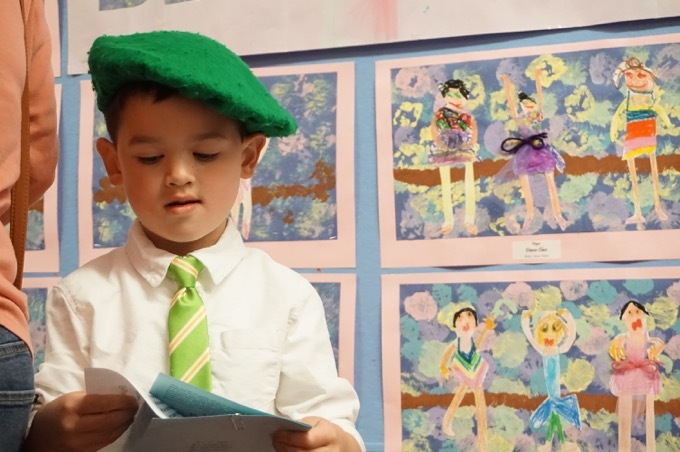 Love the photo of Damian and Hoang at the end of the post, too.